On March 22, Nurul Izzah made another shocking resignation. 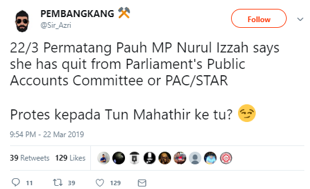 This time, she resigned as a member of PAC. Previously, in December 2018, she stepped down from her positions as PKR vice-president and Penang PKR chairperson. The announcement of her departure from PAC was made after the committee chairman, Ronald Kiandee jumped from UMNO to Bersatu. Nurul’s decision then led to a debate on Twitter. Initially, the tweets related to Nurul was low on the day she announced her resignation. Most of the accounts who tweeted on the issue were media and politicians. Notable media accounts are MalaysiaKini, Malaysian Insight, Utusan Malaysia and The True Net. Meanwhile, the account Sir Azri also gathered a significant amount of attention. Sir Azri is the official Twitter account of UMNO Youth Exco Wan Muhammad Azri or better known as Papagomo. He tweeted Nurul’s resignation as PAC member in his tweet. Then, he proceeds to tease her. Asking whether her departure from PAC is a form of protest against Prime Minister Tun Dr Mahathir Mohamad. 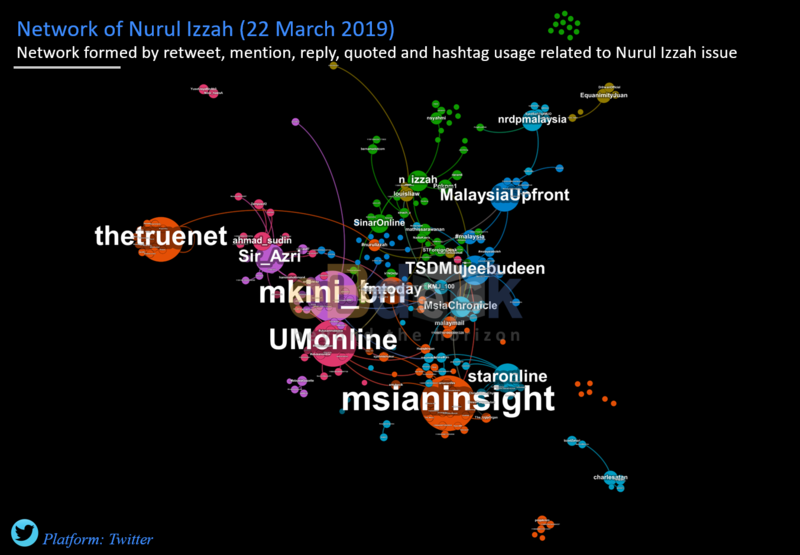 Nurul Izzah’s resignation only started to become a hot issue in Twitter on March 24. This is because of Nurul’s interview with a Singaporean press, The Straits Time. In the interview, she said it is difficult to work with Tun Mahathir who is a former dictator. According to the network, the blue cluster is the central point which connect several clusters together. This is because the influencers in this cluster are consist of media accounts such as MalaysiaKini, Star Online and Malaysia Chronicle. The issue discussed in this group is about Nurul protest towards Tun M for maintaining Ronald Kiandee as PAC chairman. She insisted that the committee chairman shall be represented by a member of the opposition, hence her resignation. The orange cluster below the blue also consist of media accounts as its influencers. There are Malay Mail, Malaysian Insight and Astro Awani. However, the topic addressed in this group differ from the blue cluster. The orange cluster discussed on the statements made by Nurul during her interview with The Straits Times. Nurul Izzah said that she is frustrated with the current political condition in Malaysia, such as Pakatan Harapan accepting the membership of former BN politicians and embracing Malay agenda to attract voters from the rural. On the other hand, the heated debate actually happened in the green cluster. This group consist of Nurul Izzah and PKR deputy president Azmin Ali as influencers. 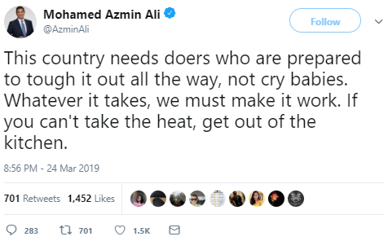 Azmin tweeted that the country needs doers who are prepared, not cry-babies. Netizens quickly assumed that the tweet is directing at Nurul. Politicians like Khairy Jamaluddin and Nik Nazmi came into Nurul’s defence, labeling her as a woman with principles. When Azmin was questioned by the media for the “cry baby” remark, he clarified that the tweet was for himself, serving as a self-reminder. Overall, Twitter users in the green cluster are divided. Some are supporting Nurul, while others are supporting Azmin. Whereas, the pink cluster discuss on another announcement made by Nurul during her resignation press conference. The Permatang Pauh MP stated that she won’t be contesting in the next general election. Besides, she said that the government is too obsessed with the 1MDB scandal rather than focusing on the real issues. 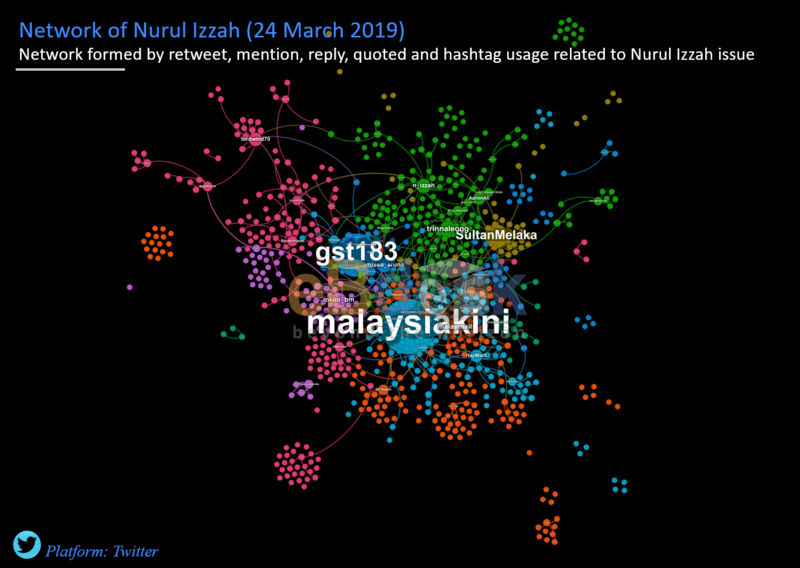 As a conclusion, Nurul Izzah resignation only became a hot issue in Twitter after her interview with The Straits Times. Nevertheless, Twitter users’ opinions on her resignation were divided. Despite all the drama, Nurul re-joins PAC after BN Noraini Ahmad was elected as the committee chairman on April 4.